Shrink Tunnels can be thought of as just a big hair dryer with a conveyor going through it, but that is just a simple description of how they work. These machines are much more complex in their design details because of the extreme high temperatures their parts have to withstand. One word describes the reason for the existence of shrink tunnels. That word is PLASTICS. 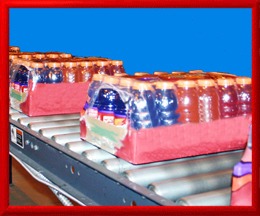 No other material has done more to revolutionize the world of packaging than plastics. This material is now so prevalent in the industry one could say it is pervasive. I will now describe a simple application that a shrink tunnel would be used for. One of the keys to prevent damage to finished goods during transit is to assure a good to fit between packaged components with no chance for movement. This reduces breakage or damage from the vibration of loose items. Here is but one of many examples where plastics and heat shrink tunnels work well together. Many years ago soda came thick glass bottles that were loosely fitted into the square pockets of wooden cases. After stacking the cases 8 to 10 units high, the stack got very wobbly. Why? Because the bottles were not unitized and floated around individually in their own pockets. Now with plastic wrapping the case of soda is wrapped then passed quickly through a heat shrink tunnel. The wrap shrinks tight as a drum around the entire case unitizing all the bottles into almost a solid block. Now the cases can be stacked safely with no wobble and these are again stretched wrapped into a unit once they are on the pallet, but this is done with a different type of plastic film. This film is like a heavy Saran wrap and unitizes the goods on the pallet using tension not heat. I used to repair and/or rebuild shrink tunnels. Most of the time the temperature controls or electric heater elements had burned out and had to be replaced. Electrically these machines are not that complex at all, but they were interesting to work on and observe them in action to see how they worked.